Prairie Mines & Royalty ULC (formerly known as Coal Valley Resources Inc.) pleaded guilty in Alberta Provincial Court on June 9, 2017, to two counts of violating the Canadian Fisheries Act. The Honourable Judge C.D. Gardner sentenced the company to pay monetary penalties totalling $3,500,000. Of the total fine, $1,150,000 of this sentence will be put into a trust to be managed by the University of Alberta to create the Alberta East Slopes Fish Habitat and Native Fish Recovery Research Fund. The remainder of the monies, $2,150,000, will be directed to the Environmental Damages Fund. On October 31, 2013, a dike that was holding back a large volume of waste water at the Obed Mountain Mine failed, resulting in more than 670 million litres of contaminated water and sediment (made up of coal, clay and sand) spilling into the Apetowun Creek and Plante Creek and additionally impacting the Athabasca River. The case was a multi-year joint investigation by Fisheries and Oceans Canada, Environment and Climate Change Canada, and the Province of Alberta. one count of depositing or permitting the deposit of a deleterious substance of any type in water frequented by fish in contravention of s.36(3) of the Fisheries Act. In addition to the penalties under the Fisheries Act, Prairie Mines & Royalty ULC has pleaded guilty to one count under Alberta’s Environmental Protection and Enhancement Act. For further information on that charge, see the Alberta Energy Regulator’s news release. 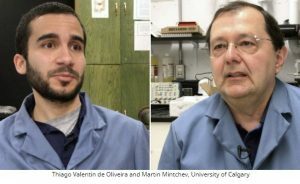 As reported in the Huffington Post and the CBC, Researchers at the University of Calgary say they’ve developed a way to get oil to its destination without spilling a single drop. Engineering professor Martin Mintchev and master’s student Thiago Valentin de Oliveira say their leakless pipeline prototype could be a near-risk-free solution — if companies are willing to shell out for the increased cost. The proposed pipeline has three things that make it different: it’s double-layered, segmented and has real time wireless monitoring sensors embedded in each section. The inner-most pipeline would transmit the fluid, and if a leak were to occur, it would end up in the air gap between the inner and outer layers, where it would immediately be detected from a central monitoring station. The spill would be contained to one segmented section. As pressure builds, oil will leak into the adjoining segment, tripping the next set of sensors (by filling the space between the two pipes with fluid, interrupting the connection) and giving crew even more time to respond. This gives workers multiple layers of fail safes so they have time to react, reduce pressure and fix the problem before a drop ever leaves the pipeline. Double-layered pipelines are not a new idea. Mintchev told HuffPost Canada that double-walled lines were first proposed in the 1980s and are now in the public domain. In 2015, a double-walled pipeline at Nexen’s Long Lake oilsands facility in northern Alberta spilled 32,000 barrels (five million litres) of bitumen, sand and wastewater. The pipeline was less than a year old, and was built with new technology at the time. But, the pipeline didn’t have segmentation to contain the rupture, and its warning system didn’t detect it in time — Nexen said it may have been leaking for up to two weeks before it was discovered. “If we could turn the time back and use the Nexen pipeline that would utilize our technology … this leak would have been prevented completely and inevitably,” Mintchev says. Mintchev says that in the case of the Nexen spill, the pipe was filled with sensors, but they generated numerous false alarms that motivated employees to turn the sensors off, which was one of the reasons the spill went undetected for so long. Nexen isn’t alone when it comes to having a flawed leak recognition system. A 2011 report from TransCanada on the Keystone XL’s environmental impact noted that its systems can’t detect leaks lower than 1.5 to two per cent of the pipe’s flow rate. For a pipeline that will carry 830,000 barrels of oil each day, that’s a lot. In Mintchev and de Oliveira’s proposed pipeline, a leak interrupts the connection between sensor stations, so it’ll be immediately obvious something is wrong. The proposed technology would be more expensive than regular pipelines, depending on whether or not the pipeline needs to be replaced or can be modified, Mintchev says. If oil companies start by only upgrading pipelines in sensitive areas — near water crossings, ecological reserves and towns — Mintchev says the benefits would far outweigh the costs. A team of researchers from Northeastern University and the Environmental Working Group recently released a report that showed that numerous locations across the United States had drinking water contaminated with perfluorocarbons. PFCs – highly fluorinated toxic chemicals, also known as PFASs, have been linked to cancer, thyroid disease, weakened immunity and other health problems. New research from EWG and Northeastern University in Boston details PFC pollution in tap water supplies for 15 million Americans in 27 states and from more than four dozen industrial and military sources. EWG and the Social Science Environmental Health Research Institute at Northeastern collaborated to produce an interactive map that combines federal drinking water data and information on all publicly documented cases of PFAS pollution from manufacturing plants, military air bases, civilian airports and fire training sites. On the map, blue circles show public water systems where PFCs were detected in public drinking water systems – the larger the circle, the more people served by the system. Clicking on a circle brings up detailed information, including contamination levels. Red dots indicate a contamination site in Northeastern’s PFAS Contamination Site Tracker. Clicking on a dot brings up detailed information and links to more information and resources from the Institute. The map, which will be updated as more contamination is discovered, is the most comprehensive resource available to track PFC pollution in the U.S. Its release coincides with a major PFAS conference June 14 and 15 at Northeastern which will bring together scientists, regulators, activists and others to examine a class of pollutants that contaminate water, soil, and the bodies of animals and people worldwide but were little known until recently. The map focuses on the most well-studied fluorinated compounds – perfluorooctanoic acid or PFOA, formerly used to make DuPont’s Teflon, and perfluorooctanesulfonic acid, or PFOS, formerly an ingredient in 3M’s Scotchgard. Because of their nonstick, waterproof and grease-repellent properties, these and closely related chemicals were used in hundreds of consumer products and industrial applications, including cookware, outdoor clothing, food packaging and firefighting foam..
PFOA and PFOS are known as “long-chain” PFCs because they are built around eight or more carbon atoms. They were phased out in the U.S. after information became known about their health hazards. Despite widespread contamination and mounting evidence of health hazards, there are no federal regulations for PFOA and PFOS in drinking water. Last year the U.S. Environmental Protection Agency dramatically lowered its nonbinding health advisory level to 70 parts per trillion for either chemical or the two combined. FLIR Systems, Inc. (NASDAQ: FLIR) recently announced the Griffin G510 Gas Chromatograph-Mass Spectrometer (GC/MS), its first person-portable chemical identifier. The FLIR Griffin G510 enables military and civil responders to easily sample all phases of matter, including solid, liquid, and vapor, to rapidly identify chemical hazards in the field. The versatile Griffin G510 represents a new-generation of portable GC/MS capability, with multiple integrated sample inlets that simplify on-scene analysis and a technology core that delivers actionable, lab-caliber answers. The FLIR Griffin G510 comes equipped with an integrated heated sample probe designed for downrange missions. When used in survey mode, it identifies vapor-phase chemicals within seconds. The split/split-less injector allows for environmental, forensic, and hazardous material sampling by enabling syringe injection of organic liquids, a first for person-portable GC/MS systems. Featuring a nine-inch touchscreen, the FLIR Griffin G510 can be operated while wearing full personal protective equipment when in a hot zone. When a chemical threat is automatically identified using industry-standard NIST library, the FLIR Griffin G510 alerts the operator with audible, visual, and color-coded alarms. Designed to withstand harsh environments, the FLIR Griffin G510 is IP65-rated, dust-tight and spray-resistant. Long-lasting, onboard, rechargeable batteries ensure every mission receives support from beginning to end. Terrapure Environmental recently received an Environmental Leader Award for Product of the Year for its creative use of technology – the centrifuge – which provides its customers in the petrochemical and refinery sector with significant environmental and financial benefits. reduce costs and environmental impacts associated with transportation and disposal of waste. Modern centrifuge technology is not new but Terrapure’s application in waste management is innovative and useful. Terrapure uses centrifugation to actively separate different components within a waste stream. Many of the recovered by-products from this process, such as hydrocarbons and water, can go back to customers for re-use at their facilities, encouraging a cycle of recycling and re-using. Terrapure operates centrifuges of varying sizes that can process anywhere from 5,000 to 300,000 litres of material per hour. On average, Terrapure can reduce solid-liquid and liquid-liquid waste volumes by 65 to 85 percent, while recovering the valuable oil and water components for reuse. While the caliber of entries was exceptionally high this year, judges agreed that Terrapure’s use of technology was particularly notable. As one judge explained, “while centrifuge technology is not a new concept, Terrapure’s application is very innovative.” For more information on the Environmental Leader Awards, visit https://www.environmentalleader.com/environmental-leader-product-project-awards-2017/. Companies facing environmental cleanup liability typically confront claims that are brought multiple decades after the alleged polluting activity took place. This passage of time often results in the loss or disappearance of crucial historic documents, including insurance policies, necessary to respond to the claims. Historic general liability insurance policies issued before pollution exclusions became commonplace in the 1970s are of particular value in protecting a company from exposure to “long-tail” environmental liability. Finding these policies, or evidence of their existence, therefore is a must. A recent New Jersey federal court decision serves as a helpful reminder that when the actual policies cannot be located, even limited documentary evidence of their existence, when buttressed by the expert testimony of a credentialed insurance archaeologist, may be sufficient to prove the coverage and facilitate recovery. In E.M. Sergeant Pulp & Chemical Co., Inc. v. Travelers Indemnity Co., Inc., Civ. No. 12-1741, 2015 WL 9413094 (D.N.J. Jan. 17, 2017), the plaintiff policyholder was seeking insurance coverage for defense and indemnity relating to environmental pollution claims arising out of a New Jersey site. The policyholder, a distributor of heavy industrial inorganic chemicals and raw materials, owned property in Newark from 1942 to 1984. In 2004, the United States Environmental Protection Agency notified the policyholder that it was a Potentially Responsible Party (“PRP”) with respect to the Diamond Alkali Superfund Site. In 2009, the policyholder was sued as a third-party defendant in a lawsuit alleging property damage caused by environmental pollution from activities occurring 50-75 years ago. Faced with this potential cleanup liability, the policyholder conducted a historical search for insurance policies covering the time period of the alleged polluting activities. The search failed to disclose any insurance policies, but it did produce a handful of documents containing scattered information identifying a certain insurance company and years of possible coverage, but no detail about the terms of coverage. The insurance company denied that it had issued any policy, so the policyholder sued it for coverage. On the insurer’s motion for summary judgment, the court concluded that the policyholder’s indirect (or secondary) documentary evidence of coverage, while “scanty,” was “barely sufficient” to defeat the motion because it was supplemented by the expert opinion of an insurance archaeologist with 30 years of experience. The policyholder’s documentary evidence consisted of (1) four pages of handwritten entries in its bookkeeping ledgers, (2) an application submitted to another insurer in 1964, (3) a note relating to the application and (4) certain standard policy forms that it obtained from the insurance company in discovery. In addition to this documentary evidence, the policyholder submitted the opinions of an expert in the field of insurance archaeology, an area involving the reconstruction and auditing of historic insurance coverage. The expert expressed his opinion that the missing policies provided coverage for “public liability,” including third-party bodily injury and property damage, and that the coverage was continuous from 1948 through 1965. The court observed in its ruling that a missing policy is not fatal to a policyholder’s coverage claim, but emphasized that the policyholder has the burden of proving the existence and terms of the missing policy by a preponderance of the evidence under New Jersey law. It noted that other jurisdictions have utilized a higher standard of “clear-and-convincing” evidence. The key factor for the E.M. Sergeant court, however, was the expert testimony which provided sufficient illumination of the otherwise limited documentary evidence. Search for pre-pollution exclusion policies or evidence of such policies. Prioritize locating general liability insurance policies for the time period of the alleged polluting activity and, if they cannot be found, carefully search the company’s historical records for any evidence of that coverage. A search should include not only the company’s insurance files, but also its financial records and claims files. As the M. Sergeant case demonstrates, ledgers and other bookkeeping records, including cancelled checks, may identify insurance companies in entries noting premium payments or refunds, and perhaps reference specific policy numbers. Claims files similarly may identify an insurance company that paid to defend or settle a claim in a particular year. Check with your broker(s). The records of a company’s insurance brokers can be a treasure trove of information. Brokers may have retained information on the placement of coverage in relevant years, including the specific insurance companies, policy numbers, limits and terms of coverage, if not the policies themselves. It is noteworthy that in the M. Sergeant case the broker’s records were not available, but they could have bolstered the policyholder’s otherwise meager documentary evidence. Consider retaining an insurance archeology expert. The most significant takeaway from M. Sergeantis the singular importance of the insurance archaeologist expert’s opinions with regard to the documentary evidence in that case. The expert opined, based on the available documents, that the missing policies included coverage for third-party property damage (that is, the environmental contamination), and that coverage continued for almost 40 years. As the court acknowledged, the expert’s opinion supplemented the documentary evidence and was the “difference” in a close case. Insurance archaeologists may also assist in the search for secondary evidence of lost policies, both inside and outside of the company. This may be especially warranted in situations where a company is charged with inherited environmental liability from an acquisition, compounding the already tedious task of searching for historic records. Know your evidentiary standard. It may be that more robust secondary evidence of historic insurance than that available in M. Sergeant would prove to be sufficient even without an expert’s opinion — at least under the “preponderance” evidentiary standard. In states with a higher burden of proof, however, an expert may be particularly valuable. Regardless of the evidentiary standard, it now behooves policyholders seeking coverage in a missing policy case to consider retaining an insurance archaeology expert to supplement available secondary evidence of coverage. Experienced insurance coverage counsel can provide helpful guidance and recommendations on this and other complicated issues in long-tail environmental coverage matters. This article was first published on the Beveridge and Diamond website. 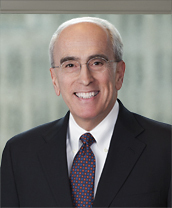 John H. Kazanjian is the Managing Principal of Beveridge & Diamond, P.C.’s New York, New York office. He also chairs Beveridge & Diamond’s Insurance Coverage and Recovery practice, and has served as a member of the Firm’s Management Committee. Mr. Kazanjian has over forty years of experience in complex civil and commercial litigation, including trials and appeals in federal and state courts throughout the country. Mr. Kazanjian concentrates his practice on the representation of policyholders in insurance coverage disputes and manufacturers in product liability, toxic tort and mass liability cases. He also has extensive litigation experience in a variety of other areas, including antitrust, trade regulation, intellectual property, banking, business torts, securities, commodities, contracts, construction, defamation, international, real estate, admiralty and maritime disputes. In addition, Mr. Kazanjian has substantial experience in alternative dispute resolution, including arbitration and mediation. Mr. Kazanjian has represented numerous corporate and governmental policyholders seeking insurance recovery for bodily injury, property damage, financial loss and other alleged liabilities. His clients have included chemical, oil, tire, building products, pulp and paper, mining, recycling, technology, beverage, pharmaceutical and medical device manufacturers as well as hotel operators, franchisors, home builders, property developers and owners, financial services companies, universities and municipalities. 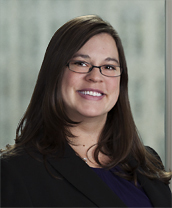 Nicol e Weinstein focuses her practice on insurance recovery, environmental litigation, and regulatory matters. Nicole excels at identifying avenues of coverage and defense, and in distilling complicated requirements into understandable terms. Working with legal teams litigating, arbitrating, and mediating to successful settlement in coverage disputes, including suits involving general liability, professional liability, umbrella and excess liability, and Bermuda form policies for industries such as housing development, electronics, security, and hotels. Advising on claims under various other types of policies in multiple industries, including specialty environmental and property policies. Defending Fortune 500 companies against claims for cost recovery and contribution in multi-million dollar CERCLA cleanups. Successful defense on behalf of a waste management company to protect its agreement with a municipality to operate a landfill against an appeal by residents claiming that proper notice procedures had not been followed. Handling product liability cases related to alleged groundwater contamination involving a gasoline additive. Working as part of a team of Beveridge & Diamond attorneys, Nicole assisted with briefing efforts that successfully precluded irrelevant, costly discovery. Nicole serves as co-chair of the Emerging Issues Subcommittee of the American Bar Association’s Section of Litigation Insurance Coverage Litigation Committee. She is also an Adjunct Associate Professor for the School of Professional Studies at the City University of New York, where she teaches a Business Law II course for undergraduate students in the Business program. Prior to joining the Firm, Nicole practiced insurance coverage with a national law firm and served as a law clerk to the Honorable Catherine M. Langlois, now retired, in the Superior Court of New Jersey, Morris and Sussex County, General Equity Division. After her clerkship, Nicole earned an LL.M. in environmental law from Pace University, during which time she interned with the Environmental Protection Agency, in the New York/Caribbean Superfund Branch. The Ontario Environment Industry Association’s (ONEIA’s) annual golf event brings together a mix of environmental businesspeople from a range of companies to support the Association. Prior to the afternoon of relaxing golf and networking, we offer an exciting morning program with speaker Karl Baldauf from the Ontario Chamber of Commerce who will be speaking to the topic of environmental exporting in an age of tight borders and “buy America”. We will conclude the day with a banquet dinner and awards presentation. A variety of sponsorship options are available. Please CLICK HERE to view the package or contact Marjan in the ONEIA office for further information at: mlahuis@oneia.ca or 416-531-7884 ext. 2. Participating companies are invited to donate branded items for bags that will be given to all registrants. Items such as ball caps, pens, stress balls, note pads, key rings, golf balls, tees, and other items provide an opportunity for you to expose your brand to more than 120 golfers. If you would like to donate promotional items for the registration bags, please send an email to Marjan at ONEIA, mlahuis@oneia.ca, or call 416-531-7884, ext. 1. Hazmat Management Magazine’s weekly e-newsletter is distributed to over 18,000 environmental, cleantech, and hazmat professionals in North America. Have your company’s product or service included in our company profile section of HazMat Management’s weekly e-newsletter or web site. Starting at only $695.00 per month (4 times) for the e-newsletter, advertising in Hazmat Magazine provides your organization with a cost-effective means of reaching your target audience. For more information on marketing in Hazmat Management magazine, contact Brad O’Brien at 416-510-6798 or bobrien@hazmatmag.com. Bruce Tunnicliffe, President of Vertex Environmental Inc. Learn about the programs and initiatives undertaken by the CBN this past year and where the organization is heading in the year to come. Coping with an evolving regulatory environment doesn’t have to be an exercise in frustration – join our panelists as they guide you through the latest changes in the regulatory landscape. This interactive session features a discussion of the latest research on brownfields policy, redevelopment and remediation science. At the conclusion of the presentation, you’ll have an opportunity to recommend and prioritize future research areas – research YOU can use in the next generation of brownfields! It isn’t only regulations that evolve; case law moves at an even faster pace! Join this discussion of recent and important changes in the interpretation of the law that will affect brownfields practice in the near future. As brownfield redevelopment benefits, barriers and regulations become more broadly understood by local government bodies, we’re seeing an increasing number of innovative policies, programs and projects emerge across Canada. In this session, panelists will discuss various approaches being used to catalyze and accelerate the brownfield redevelopment process at the local level. This session provides a series of short, highly condensed presentations packed with information on new and emerging technologies that may influence current approaches to brownfield redevelopment – tools that can help you move into the next generation. 4:00 PM Award Winning Projects – Where Are They Now? This session will present updates on two Brownie Award-winning projects: Brantford’s Sydenham Pearl and Hammarby Sjostad (Stockholm, Sweden), so you can catch up on the progress both have made as they turn former brownfields into important parts of their communities – the current generation becomes the next generation! Join us as we celebrate individual excellence in brownfields through the presentation of the 2nd Annual HUB Awards. Who will be acknowledged? Renowned urban expert Ken Greenberg will open the conference with a discussion of how repurposing obsolescent lands is helping to create new models for city building. 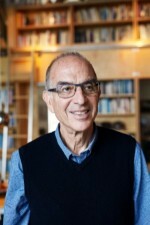 Ken Greenberg is an urban designer, teacher, writer, former Director of Urban Design and Architecture for the City of Toronto and Principal of Greenberg Consultants. For over four decades he has played a pivotal role on public and private assignments in urban settings throughout North America and Europe, focusing on the rejuvenation of downtowns, waterfronts, neighborhoods and on campus master planning, regional growth management, and new community planning. Cities as diverse as Toronto, Hartford, Amsterdam, New York, Boston, Montréal, Ottawa, Edmonton, Calgary, St. Louis, Washington DC, Paris, Detroit, Saint Paul and San Juan Puerto Rico have benefited from his advocacy and passion for restoring the vitality, relevance and sustainability of the public realm in urban life. In each city, with each project, his strategic, consensus-building approach has led to coordinated planning and a renewed focus on urban design. He is the recipient of the 2010 American Institute of Architects Thomas Jefferson Award for Public Design Excellence and the 2014 Sustainable Buildings Canada Lifetime Achievement Award. Involved in many grass roots and community initiatives he is a Board Member of Park People, a non-profit dedicated to the improvement of Toronto’s parks. He currently teaches at the University of Toronto where he an Adjunct Professor in the John H. Daniels Faculty of Architecture, Landscape and Design. He is also a co-founder and a Visiting Scholar at the new City Building Institute at Ryerson University in Toronto. A frequent writer for periodicals, he is the author of Walking Home: the Life and Lessons of a City Builder published by Random House. 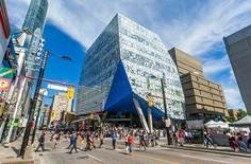 His current major project is as urban design lead and client representative for Project: Under the Gardiner in Toronto. The conference will close with a networking cocktail and the second annual HUB Awards, a celebration of today’s brownfield redevelopment leaders. Don’t miss this once-a-year opportunity to learn from and network with Canada’s most engaged “brownfielders”. Thank you to all of our current sponsors! 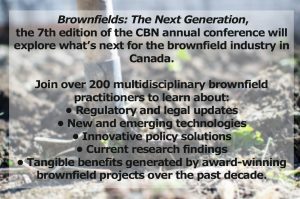 Be a part of the only National Brownfields-focused conference in Canada! You are sure to be visible to key stakeholders with ample opportunities at all budgets! Sponsorships are available at every price point, each with great visibility!